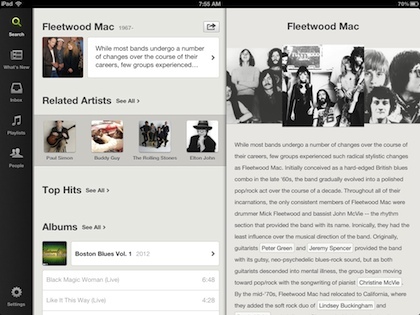 It has been possible to run the iPhone Spotify app on the iPad since it was first introduced. Install, run it in 2x mode and live with the limited view that only really looks good on the iPhone screen. 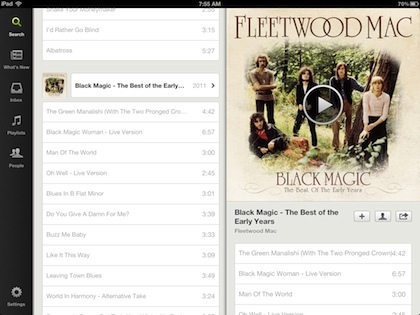 If there was a problem, the Spotify support folks just said, “Sorry, we don’t have a iPad version of our software”. Happily, that is all behind us with the Spotify app now being a Universal app. The views, screen swipes and layouts are all very much an iPad app. Spotify offers access to your iTunes music list as well the latest hits, Recommendations and Trending Playlists to choose from. 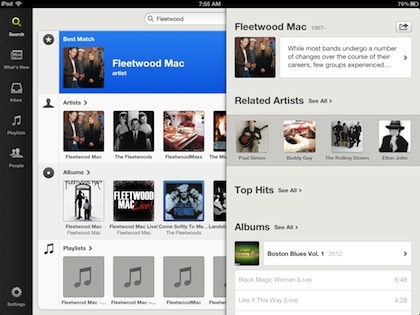 Searching will result in a list of available albums and artists that Spotify has to stream to your iPad. Choosing a band will result in a overview of information about the band’s history. When you find a album or song you like, Spotify provides the cover art and a list of the songs to be streamed to your iPad. There is also options to share with your friends information about what your listening to on Facebook. 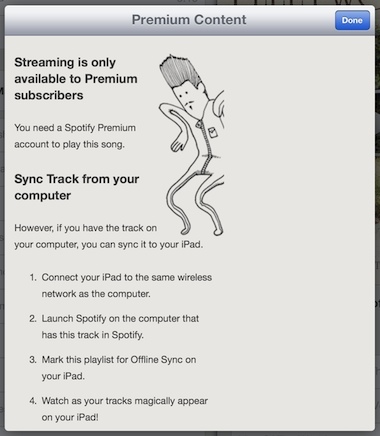 Of course, unless you have an a paid subscription, you’ll only be playing the music you have in iTunes on your desktop on the same account. 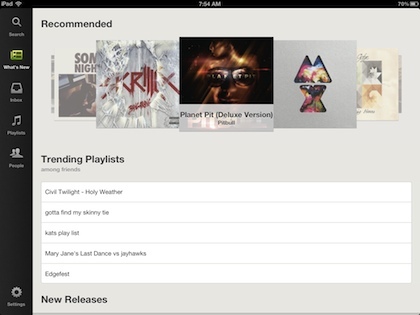 And enjoying Spotify’s information about albums that you could be listening to… if you had a paid subscription.